Bringing regular traffic to your website can be pretty challenging. It is not a easy task at all. Especially for those who haven’t developed a big brand name. All those who have just started barely get organic traffic from search engines. There are many reasons why even after months of blogging and efforts you are not getting any traffic. You are not promoting it enough. Even if you are doing it quite enough, still you need to do more to get visitors and traffic. People who get views in millions are sharing it everywhere. BTW they are not getting those 1M just by sharing, major role is played by search engines in bringing their traffic. But since Google is not placing you in your keyword search, you have to do something else to get recognized by google bots. As mentioned above, most of the traffic is provided by search engines. So your website is not optimized enough due to which you are not getting traffic from Google, Yahoo! or Bing. Optimize your site the best you can But let me tell you it is very intensive and time consuming. But all of that time is worth spending if you are doing it correct. Since Google Blogger users are not able to SEO their site since they do not have control over everything, you can still use the keywords and tags and description etc. to optimize the best you can. Read How to Optimize your Blogger Website Blog. All necessary details have been mentiond in this and following and applying these steps with create a drastic change in the viewer count. For SEO I always recommend WordPress. But still there are many Reasons why Blogger is better than WordPress,. If your content content is copied it will never let your content stand out. Never copy other’s content since google will soon recognize it and will remove you from their search results. You can use other blogs to do your research and provide better quality to the readers but spamming and the ‘copy paste’ will not work. Well you may not copy someone else but many do. I know alot of people who take one paragraph from one website and then other from next link. All photos they use have copyright and therefore Google again ditches them in placing in search results. Oh, by the way Always use photos without any copyright claim on it. Or you can make one yourself in photoshop. It is pretty easy to do so and barely takes any significant amount of time. Backlinks. Your blog or website is not getting enough backlinks from other sites or blogs. You require backlinks so google can trust that your site can be trusted and therefore it can place it in the search results. Also you can interlink your articles in your blog which will not only redirect users to your other articles but also will improve the ranking. If you have read this far. Thank You. Here is another reason which you may find useful. 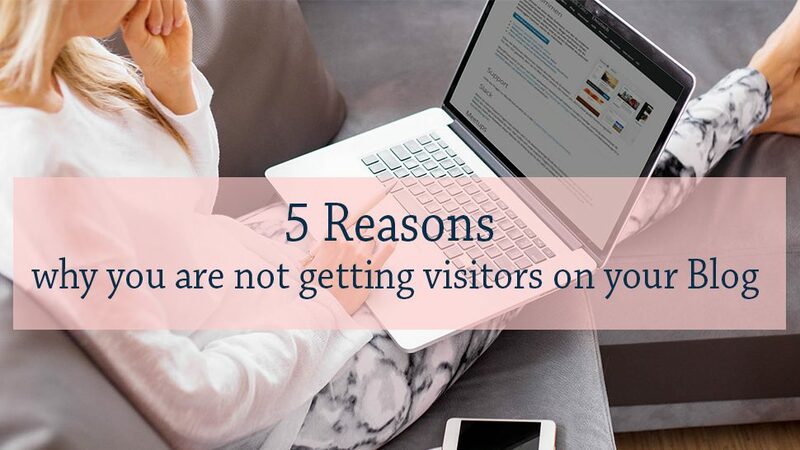 One of the biggest reasons why you are not getting visitors is that your content is not enough. You cannot expect search engines to show the blogs with 2-3 articles to its users otherwise it will become so spammy and hard for the person to search the required and relevant information. Not getting required traffic for a long time can be a headache for many because it makes you feel like you aren’t good and worth for blogging. So most of the time people quit. It becomes soo frustrating and exhausting and seems like an impossible task to do and a goal which cannot be achieved. So much that after sometime you want to bang your head against the computer. So these 6 reasons if kept in mind in the beginning will save your head in future. The most asked question from me on Quora is that how can they write awesome content or how they can become better at blogging. Well you need to fix these things first and you will undoubtedly get better. Alot Better. And when it gets better, you will feel better and motivated for blogging more.